Psycho was a critically acclaimed movie from Universal Studios that was released back in 1960 directed by Alfred Hitchcock and starring Anthony Perkins and Vera Miles. Now, esteemed slots developer NextGen Gaming have launched the movie as a slot title. Get your shadowy stabbing actions ready! Janet Leigh, we're coming for you! This is a 5 reel, 25 payline slot that was made possible due to a licensing deal agreed between Universal Studios and NextGen Gaming. It is a slot that experienced a high level of publicity during its development and now it has finally hit the market it is set to be another branded slot that will capture the imaginations of slots players. The atmosphere of the Hitchcock movie is immediately apparent with the intro to the slot and this eeriness continues into the reels. Symbols on the reels include Norman Bates, Marion Crane, a peep hole, a Bates Motel room key, an envelope of money, and the regular 10-through-to-Ace symbols. Do Not Fear the Wild! The Wild is represented by a creepy Wild icon. This symbol substitutes for all other symbols across the reels, except for the Scatters, to help complete any potential winning combinations. Furthermore, if you trigger any wins that include Wild symbols then you can earn up to a 20x multiplier on to your winnings. There are Scatters on the reels that are represented by the Bates family home. Once again, it does look rather creepy which is cool. You will need to hit three or more of these Scatters on the reels to trigger the free spins bonus round. 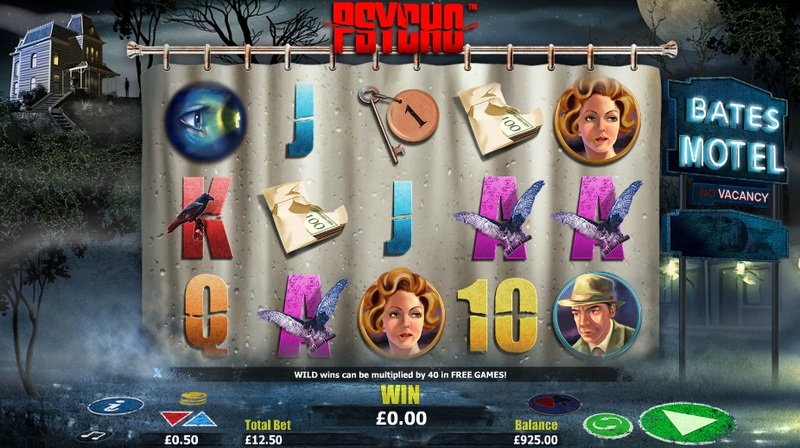 It is possible to trigger up to 20 free spins. Interestingly, there is a great little feature added into the free spins which makes a change for a NextGen Gaming slot. More Wilds can appear across the reels during the free spins and the Wild multipliers are increased from 20x up to a possible 40x. I have to admit, I have mixed emotions over this slot. The whole atmosphere of the slot is incredible and really translates the uncomfortable feeling from the movie. The music and vibe of the reels will leave you on the edge of your seat. However, I did expect something slightly more imaginative on the creative front where the game play is concerned. If you also take into consideration that the pay outs are not the greatest then you might feel that this slot flatters to deceive. I suppose the best way to describe this slot is that aesthetically it is right on the money but in terms of game play it is left wanting. 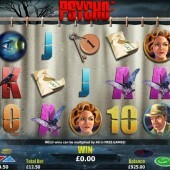 You're probably better off with NetEnt's eerie Universal Studios slots such as The Invisible Man slot or The Creature From the Black Lagoon slot.